The Orcas usually approach the bay to rub against the pebbled beach in shallow water close to the shoreline, in as little as 1.8 m (6 feet) of water. It can be very close to the beach during high tide. The sea should be smooth and avoid windy days. The chance to spot them increase if you overnight at the campground at Bere Point Regional Park and select an ocean view site. The campground is serviced during summer only. In the evening we spotted Humpback Whales and in the morning Orcas which were rubbing on the pebbles. The precipitation of Vancouver Island's east coast is just 700-800 mm per year. In contrast, the west coast of the island is exposed to moisture-packed winds blowing from the Pacific Ocean and receives plenty of precipitation from October to March. Summers are in general relatively dry. Spring is always a great time to visit Vancouver Island. Daily temperatures range from 11-15 ºC. It's a great time for wildlife viewing. The Pacify grey whales are on their route to Alaska, Grizzly and black bears finish their hibernation a looking for food along the shoreline. From June through September, Vancouver Island is typically sunny and mild although the temperature at Malcolm Island seldom goes beyond 15-17°C but can reach up to 25°C. In fall you may see a lot of fog especially in the morning which could last until mid-day or afternoon. The temperature is on average around 12°C. Vancouver Island enjoys a moderate and mild winter in most regions. This allows outdoor activities such as fishing and hiking in the south-coastal areas even in January. Incredible hotels near Orca Rubbing Beach - Vancouver Island or in Canada? Check Booking.com (bookmark the link) since they guarantee the lowest rates! Spotting the orca rubbing behavior or seeing whales offshore is a memorable experience. You could see humpback whales swimming close to the shoreline and listen to breathing orcas enjoying the pebbled beach. The Orca's move their bodies against the pebbles on the beach. Often rolling upside down, rubbing them along it. The accepted hypothesis why these whales rub on these beaches is that it’s a cultural behavior for the Northern Resident community of Orcas. Bere Point Beach is made up of millions of small smooth pebbles covering a long, wide gradual slope. Perfect conditions for an orca to rub themselves up against without harm. To get the best experience, and cause no disturbance to the whales; simply sit down, remain quiet, and watch the wonder happen. Similar behavior of Orcas can be seen at Hanson Island. If you cannot make it to the island, you may check out the webcam. But be assured that experience this, in reality, is awesome and unique. Beside the orca's, eagles, dolphins, porpoise, sea lions and humpback whales are frequent the area. The Orca is a toothed whale belonging to the oceanic dolphin family, of which it is the largest member. You can distinguish between four main types, the northern and southern resident, the transient (now called Bigg's) and the offshore whales. Although all belong to the same species their social behavior, diet, and look are different. Northern Resident Orcas can be found from Alaska to the British Columbia coast. They are salmon specialists, and chinook salmon makes up the majority of their diet, year-round. These whales rely on echolocation to find their prey. They follow the annual salmon migration and are the only orca community that rubs on the British Columbia coast. Southern Resident Orcas can be found from Central Vancouver Island to Puget Sound (Washington State). They are as well fish eaters. Transient Orcas live along the west coast of North America, from California to Alaska. They are mammal-eaters, specializing on marine mammals such as seals, sea lions, porpoises, dolphins, and sometimes calves or youngsters of grey whales and humpback whales. This has caused to name them "Killer Whale". The fourth type is the Offshore Orca, which lives northeast Pacific and feeds primarily from schooling fish. "Malcolm Island is a place where humans go to create lasting memories." Situated off the northeast shore of Vancouver Island, you will find this hidden gem. It's relatively small in size (24 km (14 miles) long and 3 km (1.8 miles ) wide at its narrowest point. But Malcolm Island offers breath-taking scenery, tranquillity, great outdoor experiences, many wildlife viewing opportunities, and fascinating history. If you want to leave the Island, you should arrive early at the ferry terminal because the space for cars on the ferry is limited. To get the early morning ferry at 7:55 am is almost impossible because many people park their car in the queue the evening before. During the summer months, BC Ferries uses a small ferry (~25 cars) compared to the wintertime when a larger ferry (~40 cars) is in use. This makes the situation even worse. There are not many possibilities to stay overnight on Malcolm Island. You can either camp or stay in one of the view guesthouses. The chance to spot the rubbing orcas increases if you overnight at the campground at Bere Point Regional Park and select an ocean view site. Our favorite guesthouse is the Ocean Front Hotel. The view from your room and patio to the sea is spectacular. Request a room with a fireplace. Bere Point Regional Park is about 6 km out of Sointula where the ferry arrives. You need to pass Solintula and drive a view kilometers on a gravel road. It offers 27 campsites with 11 offering a stunning view across Queen Charlotte Strait. 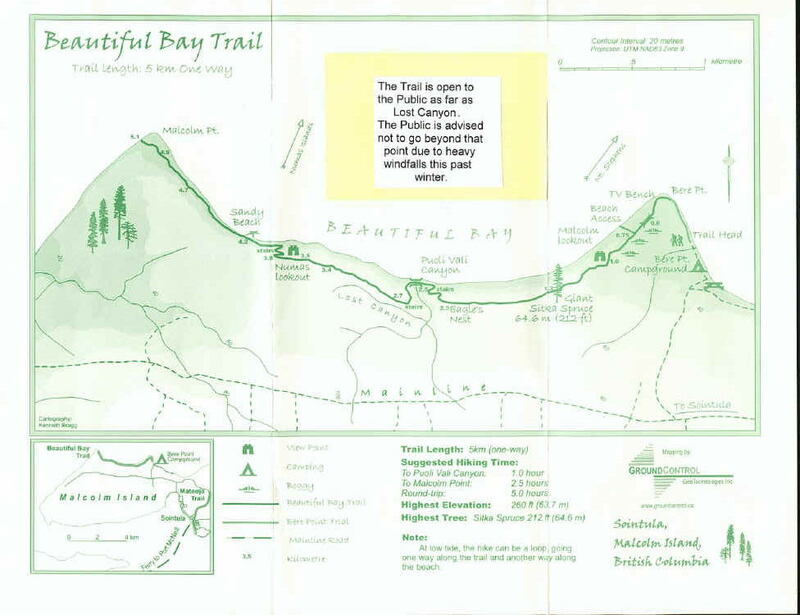 It is directly located close to the Beautiful Beach which can be hiked via the Beautiful Bay Trail. The campsites don't provide power and offer only pit toilets. You need to bring adequate drinking water. The Campground is serviced during summer only. Another option is the Harmony Shores Campground. If you get hungry, don't miss the Burger Barn at the Marina, Opens seasonal from Thursday to Monday. They offer fresh local seafood burgers with fries and homemade coleslaw. The Co-Op store is closed Sundays and Mondays but you may get what you need at the Co-Op Gas Station which is open daily.